← My Peonies don’t / won’t bloom. There is a similarity between the height of a floor lamp, and an end table with a lamp on it. Floor lamps, measured from bottom of base, to top of finial, if they have one, are usually 58 to 64 inches high. When paring an end table, with a table lamp, the combined height of the two should also be 58 to 64 inches high. (The same height of the floor lamp). At different points in time, different heights for end tables and lamp combinations were considered fashionable. In 1972 my Mother paired, what was then fashionable, a 19 inch high Mediterranean styled end table with a 44 inch high table lamp. In 1983, in my first house, I paired a Chinoiserie decorated Parson styled end table, that was 24 1/2 inches high with a 33 1/2 inch tall table lamp. Today end tables are running anywhere from 27 to 30 inches high, and are being paired with a 30 to 36 inch table lamp. No matter what the trendy style of the moment is, the combined height of the table lamp and end table stays the same 58 to 64 inches. 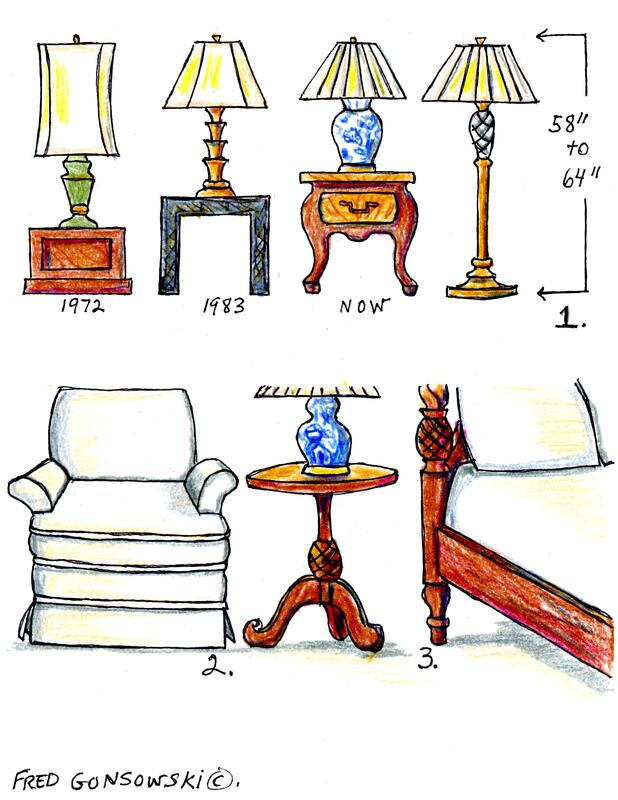 (see illustration 1 showing comparison of floor lamp and end table combinations over the years). The main reason for uniformity of lamp heights (end table with lamp, or floor lamp) is that you want the eye to move across the room in one even sweep. You don’t want it to jerk up and down from a high light source to a low one. If you have a high chest in a room, and want to place a light fixture on it, pick a diminutive accent lamp for the spot. Still try to stay, if possible, in that 58 to 64 inch range. It is OK to not be perfect, but try to go close as possible. If you are putting accent lamps on a fireplace mantle keep them kind of short, but don’t worry about lining them up with the table and floor lamps used in the room. The fireplace is a focal point of a room, and having lighting positioned higher in the room there, is not a problem. Since I am on end tables, …when picking an end table to go along side a sofa or chair, pick one that is the same height, as the height of the arm of the sofa or chair. The reasoning here is that if a person is seated and holding a drink, they can easily move their arm sideways and place the drink on the end table. (see illustration 2). If a person is putting end tables along side of a bed, try to match them up with the height of the mattress and box spring put into the bed frame. (see illustration 3). Match the end table along side a bed, with a lamp, that when they are combined, their height is also 58 to 64 inches. To know more about matching table lamps and end tables read my two posts.. Looking at the Different Shapes of Lamp Bases and Matching the Right Shaped End Table with a Table Lamp (click on post titles to read the articles). Finally, it is OK to have an end table with a lamp on it, on one side of a sofa, and a floor lamp, by itself on the other. You can flank a sofa with two unmatched end tables for shape and height. You can pair the tables with mismatched lamps of different heights and shapes, as long as the lamps and end tables measurements combined, are the same on both sides of the sofa. (58 to 64 inches). It is also OK to have 2 floor lamps flank a sofa, if there is no space for end tables. Now go through high-end decorating magazines. Notice how different lamps and end tables are combined in those rooms. Looking at the Different sizes of Patterns used on Wallpaper and Fabric 3-20-2012. Arranging Furniture in a 15 foot wide by 25 foot long Bedroom 1-24-2016. This entry was posted in Interior Decorating Principles, Lighting, San Francisco Chronicle / eHow references or resources. Bookmark the permalink. 70 Responses to The Right height of a Table Lamp for your End Table. Thanks for sending that Fred…you have great taste…east coast to west coast! Nancy, It’s always nice when a true talent, as yourself, comes by to say hi. I appreciate your comment. Hi there Sarah I appreciate when a reader gives a comment. Even the shortest is REALLY appreciated, thank you! Bless you Fred!! I have a 31 inch high reclaimed wood 3 drawer chest and cannot get another for the other side of the loveseat. You have given me hope for an attractive solution with your Total Recommended Heights! Hi Elaine, Back when my mother was young, and after the depression, having matched things said you had some money again, and were successful, these days it says you are boring;-} From the highest price point of decorating, to the everyday, it is all about the mix. The mix makes it more imaginative and gives the eye extra things to look at. How about finding a pedestal table for the other side of the sofa. The pedestal is not as heavy looking. Two 3 drawer chests might look very weighty. Just a thought, not seeing the loveseat or room. Elaine I am blessed to have people like you, who came back and made a comment. Happy decorating! Fred, thank you so much for the simple visuals. I am an interior designer and do so many things by instinct that I sometimes need someone to tell me why I do them. Of course, I had to go around my house to measure the height of all my lamps and you are dead on! Hi there Nancy, It is exceptionally nice, when someone from the Designing/Decorating World makes a comment. Thank You for putting the effort into doing it! Hi Astrid Keep the Fabulous Lamp, and stick it on top of a wonderful book that COLOR COORDINATES (Picks up one of the colors of the room). You could even make a dust jacket for a book out of wonderful paper found at a craft store. Your Eyes Deserve to view beauty, and if the lamp is Beautiful to you, you GOT to keep it. Another option might be using a wonderful silverware box, under it as a stand. You never said how much it is off. If it is really off, could it be put on a pedestal in a corner of the room, or tall dresser/chest and another lamp, the right size, purchased to go with the table. Good Luck with your project. This is the best most clear advice I have read and I have read a lot. I am so grateful. I will use what you have written to buy some lamps and arrange my art. I have one question. I have two wing chairs on a wall opposite a fireplace and I have two large photos 4 ft x 5ft that I was going to hang by them. Should I hang them above the chairs or is there a certain percent of the art work that is ok to be covered by the furniture? OK- thank you so much!! Hello I just discovered you and really appreciate your advice. I have a large sofa and above it just hung a large painting (60 x 30 inches). On either side of the sofa I have end tables and am wondering what height of table lamps I will need? Do they need to come to a certain height in comparison to the painting? Like to 1/3 it’s height or does it matter? Hi Fred, thanks so much for your response. My end tables are 24 inches in ht and are a combination of reclaimed wood and dark metal, my sofa is a dark charcoal grey, my walls are off white (Benjamin Moore mayonnaise) and my floors are natural red oak so a light color. And I can’t decide if the end table lamps shades should be a light, tan, or black color. Your insight would be much appreciated? The big 60 x 30 inch painting above the sofa is a colorful mexican street scene. Great, now I feel like I have some direction. Thank you for explaining your ideas! And so promptly! I have a sofa and loveseat in an L-shaped arrangement with a square end table and lamp between them. Can I put a floor lamp on the other end of the sofa, or will it look off-balance? Hi Belle Put the floor lamp where you are thinking of putting it. I have an end table with lamp one one side of the sofa myself, and a floor lamp that my Grandmother Gonsowski had on the other side. Keep the height/top edge of the lamp (shade) lamp and table combination, and floor lamp the same height, like the illustration for the post. Thanks you your question, by asking it, you will probably help others with the same concerns. I SO appreciate the time you have taken to help those of us that aren’t trained to know these things. I didn’t even make sure my end table was the same height as my sofa arm before I bought it, but lucky for me it was the right height. My question is if my floor lamp measures 60″, is it ok if my table lamp on top of end table is closer to 63″, or do they need to be exactly the same height? Hi Gina, the idea of having the top of the floor lamp shade, and the top of the table lamp shades being the same height, is that the eye mover horizontally across the room from one top of lamp shade to the other without dropping down or moving upward too much. If the shades are not too close together, and the drop doesn’t look to be too great or noticeable, keep what you have and enjoy your find. Thanks for all the great advice and practical (and beautiful) illustrations. You answer a lot of questions I’ve had about decorating our house. Appreciate you sharing your expertise. ps. I looked at your site and Chad as hung up the pictures perfectly. Look at the three or four articles I’ve written about hanging pictures, if you have a moment. The first one It’s easy to make a grouping of pictures should have a link to the others. I have been looking for advice about lamp heights for ages with little luck so I very much appreciate this post. I’ll look at some of the other posts you reference in the comments as well. I’m a bit stuck trying to decide whether to consciously break the rules here. I have a side table that I love that’s 25 inches tall and have found a vintage lamp I absolutely adore that is 43 inches tall. The nearby floor lamp is 65 inches. Torn between my heart and my head on this one. In any case, thanks for this very informative post. Just wanted to say thank you for your reply and encouragement. I ended up not going with that amazing lamp as much because of the nagging feeling that it wouldn’t work as for the outrageous shipping costs (a sign from the big design god in the sky?). I picked up something else in a more appropriate scale that I’m quite happy with. It’s less unique than the other lamp but that will let something else in the room be the star of the show. Hi there Erin. Sometimes the best things are the things that don’t scream out at you in a bothering way. The lamp you finally purchased might be quietly sitting there, but it isn’t saying You made a Mistake. Fate will have it, in no time, down the road, that you find the perfect something that will be the focal point of your room, and you will be glad The Design gods in the sky made it so you did not get the lamp you thought you loved. Just be patient, something is out there looking for you to come by, and it will call out to you to buy it, take it home and love it. Only buy things that smile at you, and you will be fine, look for things that you can/could live with for 1000 years, if you had to, not things to live with for a short time. Good luck with your projects, and Happy Holidays. I just found your post last Friday and have been reading your articles all weekend. What a blessing you are for those of us trying to create a lovely space who are not “classically” trained. I have a question. I have a floor lamp whose finial height is 65″. This light stands next to a old school Hollywood style sofa with 34 3/4″ high sides; no arms. I want to place an end table opposite the floor lamp on the other side of the sofa. How do I decide the height of the end table? To complicate matters more, there are arm chairs on either side of the coffee table whose arms are 24″ high. Hi Shondra, Not seeing the sofa, but trying to draw a picture of it on a piece of paper, your measurements have to be off. A chair, or sofa’s cushion height is around 17 to 19 inches tall(from floor to top of seat cushion). If a sofa had a 34 3/4 cushion it would be be as high as the mattress on box spring set into my four poster bed. If the sofa were really that tall you would want a tall table or chest along side of it to match the height of the cushion. If the 34 3/4 is the back of the sofa, match the new end table to the height of the one you already have. If the sofa is really 34 3/4 high (top of cushion), I would say try to find a table (something) that is 34 3/4 inches tall to match the height of the sofa, so the eye moves across the sofa’s cushion and does not drop down in any way, but keeps moving horizontally from left to right. Take a couple of card board boxes, or sheets of cardboard and make a square 34 3/4 inches high and place it next to your sofa to see how it would look. Seeing something at that height there, instantaneously you will know if it works or not. Good luck with your project. If you have not yet, look at the categories on the right side of the screen. Interior decorating principles has all the posts I’ve written there. At the bottom of the first page, look for older posts (it is very faint) click on it to see more articles. I am looking for end table and lamps for 2 story living room. I was thinking tall lamps for the height of room. Would this apply with a 2 story that needs height? Thank for info. I bought two end tables recently that are rectangle. http://www.ethanallen.com/product?productId=1338&categoryId=8019 Size is 18.5″ wide X 26.5″ deep. 25″ tall – in case link does not work. They will sit beside a sectional 99X99… with arms that are 25″ tall. I’m struggling to find the right lamps. Found two candidates so far. http://www.ethanallen.com/product?productId=500&categoryId=4141804.. Lamps are 31.5″ tall but the bottom of the shade is 21″ wide — so wider than the width of the end table. And then these. http://www.lampsplus.com/products/murray-feiss-antica-ceramica-ceramic-table-lamp__x6750.html – These are shorter.. Only 28″ tall (with finial). But the bottom shade is 17″ wide. I love the texture of both lamps, but neither will get me within the recommended height guidelines. so I could use your opinion – how much we can deviate from the guidelines. Our room has 9′ ceilings. The bottom of the shade on our current lamps (31.5″) sit a few inches taller than the back of the sofa. I estimate the bottom of shade on the 28″ tall lamp would be about even with the back of the sofa and the new 31.5″ lamp it would be about 1″ taller because the shade is longer than our current shades. My assessment is the 28″ lamp will fit the table well.. proportion wise. The body of the 31.5″ lamp fills the table top more, but the bottom of the shade is wider by 3″. That 3″ is what bothers me the most about that lamp. Thoughts? Hi there Deb, Looking at the style of the end tables that you bought, I am sorry to say neither of the lamps you chose/like are right. Your end table has a kind of delicate country cottage vibe, with a streamlined slickness to it/them. The lamps that you picked have a beachy kind of modern vibe, and the urn shaped bases that they have are too heavy looking for your tables. The textures of the lamps might fight the vertical stripe of the trim at the top of the tables. I think you have to go for something more light and airy. I would say try to find a lamp(s) in a antiqued brass finish, that have a torch shaped base (think about the urn/vase shape you like but narrower). You have to find something in the 33 to 39 inch range. The taller the better! When you pay for/have tall ceiling you want to accentuate that height with things that direct your eye upward. Think tall lamp and table combinations, picture groupings that stack vertically up the walls, furniture that is tall like wing chairs, to counteract lower pieces. Your question, I know, will probably be the subject of my next two posts. I have had the topics swirling around in my mind, and now think it is time to write on them.. Stay tuned to see what I come up with. Hi Pamela, looking over your site, I don’t know where my images would fit in. You seem to sell things on your site. The places where most of my images show up are on Pinterest. The people on that are interested in telling their followers the fun and wonderful things they have found. The San Fransisco Chronicle and eHow have also used my article many times as either references or resources for their articles, but those places are all about promoting information in a positive way. I think it is No at this time. Hi, there, Fred! Since I found your blog I have been reading a lot of your posts. I am trying to decorate my living-dining rooms, which are in an L shape area. I am looking at it as a whole, and not as two different rooms, since there is no a division between them. I like to decorate with my DIY projects. The one I am working on now is the lampshades of my table lamps, thanks to my dog, who dropped one and broke it. When we bought the living room, they gave us the two lamps with a discount. They have a grey-blue ceramic base, and both had white lampshades. I read your article about decorating with patterns, which helped me a lot to start this project. So, I went to get fabric, and I got one with three colors (brown, blue and green flowers/leaves) and I think that would be my medium size pattern. I am stamping on a cream color fabric using smaller size flowers/medallions and the same 3 colors. plus a little bit of orange here and there. I am almost done with one and when I put the two fabrics together they look awsome! (Thanks for that advise!). I have two questions: Speaking about patterns, can I consider a big mirror that I made with three rows of four rectangle mirrors in each row (each one measures about 12W x 8H) as my big size pattern? And, For the other lampshade, would it be ok to make a different pattern for the other lamp shade (small polka dots, or stripes with the same colors?). My living room set really needs color, because the sofas and chairs are brown, and the walls and drapes ivory and cream (neutrals). And of course, the floral fabric that I used for inspiration, will belong to one or two pillows. Thanks for sharing all you know about design! Hi there Irma, starting with the mirror you made. In my mind I am thinking of it as a Large Tone-on-Tone neutral or even as a Window Pain pattern (think about a grouping of Squares). That item is really not considered a pattern. I like the idea of the floral/leave pattern you used, and I want you to work/move it around both the living and dining room, the best you can. Make a runner for your dining room table it that pattern, and trim it in the dot pattern, or the strip you are thinking about. Can you upholster the seats of the dining room chairs, or even slipcover, or make skirts for the chairs, or at least the two end chairs so you have that fabric in the next room? Also think about using the fabric as a trim down the edge of your drapes. Not seeing your house, I want you to think about painting the wall behind the sofa the same green as seen on the leave fabric, or at least one of the shades or tints that come from a paint strip that exactly matches it. That would give you a subtle pop of color. I also want you to buy a solid colored (it could be a texture) blue throw to match the lamp bases, and some vases or other knickknacks, in that color to work it around the room. Do the same with the orange. Could you ever upholster a small foot stool or bench in that/those fabrics? How about looking for a, let’s say, 6×9 foot patterned area rug to put on top of any solid colored area rug you already have, in blue, brown, green and a brick orange, or go out and buy a large patterned rug to cover a good amount of the floor space. If that sound like something that interests you, bring your floral/leave pattern fabric with you to see if it goes with the rug. I’m thinking a striped rug could work??? In my mind, I would love it, if you could paint a/the outside wall of the dining room, facing the back of your house a pale rusty-brownish-orange/peach, to move the orange you are working with into the other room. All the things I just mentioned, I don’t know if they will work, as I am not seeing your space, but I hope my ideas will inspire you in some way. Thanks for your prompt reply. So. I think now of the mirror as the focal point of the room, because of the size and because it is the first think you see in the front wall when you enter from the front door. And actually, I recently painted that wall all along from upstairs, the stairway and the living-dining room in a light grey-blue, that matches the base of the lamps base. The sofa is not there, but in front of that wall, under a large window. Under the mirror there is a 30″ tall cabinet. The rest of the walls are ivory. The blue in the flower fabric and in the pattern that I made is blue-green (kind of aqua), and i love it so much that I was thinking to change the grey-blue of the lamp bases and that wall for that one. We have tried the green twice in some walls in my house, and nobody liked it (olive green, which is the same of the leaves, by the way). I love your idea of changing the fabric of the dining room chairs. That fabric will bring happiness to that room (the fabric now is olive green). We don´t have a door from the dining room to the back yard (it is in the other level, down, from the family room). But I can do that In the kitchen! The kitchen is behind the mirror wall but it can be seen from the dining room (open concept there). Thank you again. I will consider the idea of the rug, the table runner (but I am not sure about this, one because it’s a round table) and the other things you mentioned. And sorry for asking again, but would it be OK to make the two lamp shades in different patterns, with the same colors in both of them? Hi there Irma, My initial thought was to have the wall in blue-gray, but then I though it would match the lamp base, and the lamp would disappear. But you have a blue-gray wall and I think that is Great. As for the lamps, you can have them matched or unmatched, the choice is yours. If you want the unmatched, you have to work both of the fabrics around the room, so it is not isolated just on the shades. How about a round runner for the center of the table, It could be interesting, though I have never seen one before. Also think about getting blue-gray candles for the table, and buy silk flowers in your colors and make an arrangement or two to put here and there. You could also paint baskets the colors you are using if you like. I am just thinking about a lot of things that might inspire you, not knowing what style your furniture even is. Would you ever want to make a fabric covered screen for a corner of the living room or dining room in the fabric choices you like. Go to an art supply store and buy heavy duty stretcher strips 16 inches wide by 72 inches long. Buy enough to make 3 or 4 four panels. Most screens have 4 panels. Upholster them in the fabrics you like, and then with small hinges attach them to each other. Put one fabric on the front, and another on the back. You could even, over the fabric put ribbon in a diamond pattern and use the screen as a kind of photo display, if you like. Irma could you leave the gray-blue wall, and paint one of the walls in the dining room the blue-green aqua color that you like so you have both of the colors in your space, and them work the blue-green around the living room a bit. Interior decorating is all about finding ways of working the 3 or 4 colors that you are using to decorate with around a space. I can picture it the way that you describe it, and I love it! I’m so happy that I found you! Thank you so much, especially for your time and personal attention. I found your site today and am enjoying it immensely. I have 1 question that I have not seen addressed here. I bought a floor lamp at a garage sale, but I feel the shade is too small. How do you figure out the correct size of shades for floor lamps – or any lamp for that matter? Thanks for sharing all of your wonderful knowledge and making it so easy to understand. Hi there Holly H, When I was in need of new shades for lamps for my own house, I took my floor lamps and table lamps, with old shades to a lighting store in my area. The lady there showed me some options for color, shapes and sizes that would work. If you are looking to buy something at a discount store, first take the measurements for height of shade, width of base opening, and top opening of the shade you have. Bring a measuring tape with you and go from shade to shade that you like and see if the openings and height matches. If you think the shade is too small, think about where it looks too small to you. Does the shade look to short, or not wide enough at the top or bottom. If so, look for a shade with a wider dimension in that place. Next, measure the exact height of the floor lamp you have from base to finial, if it has one. Look at other floor lamps in different stores and measure their shade sizes, to see what size the manufacturers used. The shade you have could be a wrong size picked out by the previous owner. Also look at shade colors. Some metals look good with a crisp white, others might look better with a cream or ivory shade. I have a silver and glass ball based lamp, here in one of the bedrooms with a crisp white shade. I have Brass toned light fixtures in the living room, and some other rooms in my house that are more ivory colored. Also, a colored shade will emit that color into the room, so don’t buy that red shade, unless you want a red glow in your room. Another thing, a dark or metallic lined shade will only direct light upward, or toward the floor, not out into the room. And finally, make sure the lamp is properly wired, you don’t want your find to be costly because of some kind of electrical problem. I hope I was of some help with your problem, Thanks for the comment. Your blog is so incredibly helpful! Thank you. I keep clicking from one article to the next …. I am a beginner at all of this in my first house. I’m working on an article for REDBOOK’s website redbookmag.com and am very interested in featuring some of the tips from this post. I cannot find an email for you, would you be able to email me at …hearst.com (address has been edited for her privacy) to discuss this further? It’s my first time here. Trying to decide on a lamp for a new leather couch I’m getting. I’m attracted to a tiffany lamp that’s not too busy and has the same gold tone as the couch. Is tiffany a good match with leather? Looking forward to your continued advise. Picture hanging is quite a challenge for me too. Hi there Susan, the Tiffany lamp would look nice with a leather sofa, but it really is more of an accent lamp, versus a major source of illumination. I say get the Tiffany and use is in a star spot in the room, and back it up with a couple of more traditional cloth shaded table or floor lamps with off-white or cream shades, that will provide maximal illumination. Can I put a tall plant instead of a floor lamp? If so should the height of the plant be 58″-64″ too? I can’t find a plant that’s taller than 48″ but would that be too short? Fred, thank you so much for your response! I have an empty corner that I’m trying to fill next to the couch in my living room but since I have plenty of lighting I didn’t want to have a floor lamp or table lamp. I know your article is about the height of floor/table lamp but I was wondering if you could tell me if a 48″ plant would have similar effect as if I had a floor lamp even though it’s not high enough. I’m not trying to line up a plant and floor lamp so the plant will be on the floor without a stand. Please let me know…. Thank you for your help!! Great description! My dilemma: I have a chesterfield sofa with a 31″ high arm. I don’t want the light bulb to shine in the eyes of those seated on the sofa, so I’m trying to keep the bottom of the shade 14″ above the 32″ high end table. I’ve only been able to find shorter lamps that top out at 55″ AFF. What’s the more important rule to follow, in your opinion: the total height or the visibility of the bulb for those seated? Thanks for your time. Hi there Sam, I think it’s more about the height of the lamp, and the shape of the shade. Look for a lamp with a more cylinder shape than flaring, so the bulb’s glare is more covered versus being exposed. Hope this comment is possibly helpful. Very helpful tips! thanks for saving me (in advance) from buying wrong things for the house. Most useful post I have found on end table/lamp combo heights, thank you for sharing! I also have a chesterfield sofa 33″ arms. I am struggling with finding a table with the needed ht. Thinking of a bar cart/ lamp on top combo but the corner available is only 34″ x 26″. I have found a 24″ W Bar cart & an 18″ round cart. I am scared they may look dainty compared to a 110″ L sofa. Would it be best to just do a floor lamp? To add to this I do not have an area on the other side of the sofa for anything matching. Hi there The Sunny Store, have you read my post titled The answer to…”Can you put a Floor Lamp next to a Sofa?” that post has illustrations that might inspire you. Could you make a skirt, or have someone make a fabric cover for the bar cart? Being covered in some kind of fabric, it would not look that dainty. Something to think about. Hi there Piaka, glad to have inspired you, good luck with your bedside lamp.